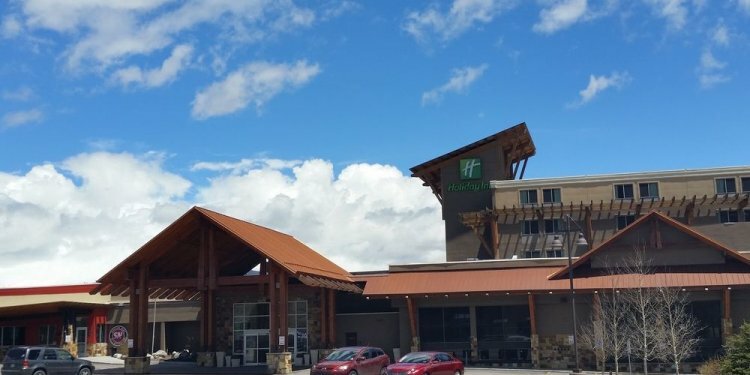 Holiday Inn Frisco - Breckenridge places you within a mile (2 km) of Bliss Massage & Wellness and EastWest Bodywork & Massage Therapy. This 3-star hotel welcomes guests with 216 rooms and conveniences like an indoor pool, a 24-hour fitness center, and free in-room WiFi. In the mountains, the hotel is also close to Paddle Colorado and Frisco Historic Park and Museum. Sit down for a leisurely bite to eat at the onsite restaurant, or enjoy a drink at the bar/lounge. Savor a meal from the comfort of your room with room service. Full breakfast is offered for a fee each morning from 6:30 AM to 10:30 AM. All of Holiday Inn Frisco - Breckenridge's 216 air-conditioned rooms provide microwaves, refrigerators, and coffee makers. Guests can expect 32-inch flat-screen TVs with cable channels, along with free WiFi and wired Internet. Bathrooms offer hair dryers and free toiletries. Other standard amenities include free newspapers, free local calls, and ironing boards. At Holiday Inn Frisco - Breckenridge, guests enjoy features like an indoor pool, a 24-hour fitness center, and a spa tub. There's free parking and a free area shuttle. Multilingual staff at the front desk are standing by 24/7 to help with dry cleaning/laundry, luggage storage, and securing valuables. Other amenities at this ski hotel include a sauna, free WiFi in public areas, and 4 meeting rooms.